Our products are designed to endure demanding use in harsh, northern conditions. Savotta products are simple, practical and long-lasting. Savotta stove & stone rack easily warm up Savotta’s tents and with the stone rack the stove can also be used as a sauna stove in Savotta’s Small sauna tent. Stove suites also perfectly for cooking. It’s quick and easy for instance to make coffee on it. 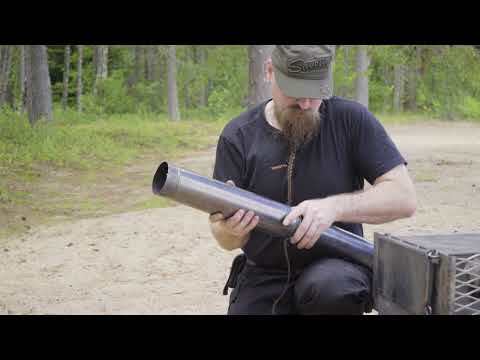 Along with the stove comes 7-parted smoke tube, which travels fluently inside of the stove. Savotta stove and stone rack are sold separately. Heigh with the stands: noin 55 cm. The product has a 1-year guarantee against material and manufacturing defects. Rolled up for transport, the chimney is a 30-cm roll weighing just 1 kg, easy to carry inside the stove or in a backpack pocket. Savotta retailers are the fastest way to get a hold on to our products that recycle users. Check the map for direction of recommended navigation. Tracking Savotta in social media is easy ’cause we don’t really cover our tracks. Our products are made to endure and our customer service exists to help. If you have a question without an answer or a rare annoyance with our product, don’t hesitate to contact us! Excited about Savotta? Have a hands on attitude? You might be our retailer.